In Orton Gillingham, basically the whole English language is divided up into categories and each category is divided into rules. I have given one “Short Vowel Rule,” known as the FLOSS rule. Today, I am moving to a second (of four) short vowel rules: the “K” Rule. This means, one syllable words that contain a short vowel and the “k” sound at the end will have a –ck to make the “k” sound. If there is not a SHORT vowel sound, then it is not –ck. 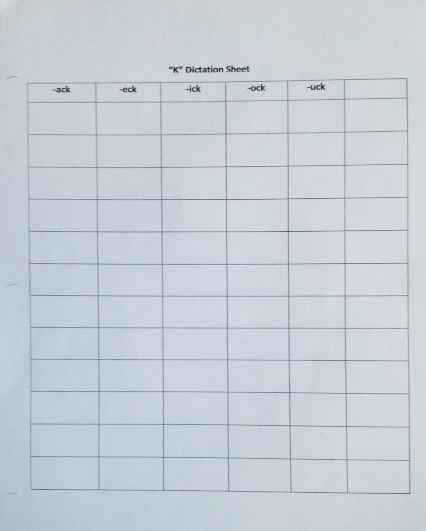 Here is the worksheet I was given in class, called a “cloud” sheet, which helps with the rule. It’s a great tool to give students for an overview of the rule, its exceptions, and it provides for thinking about the rule and what it means by having to fill in some of the information themselves. It is also a good visual for a classroom discussion. 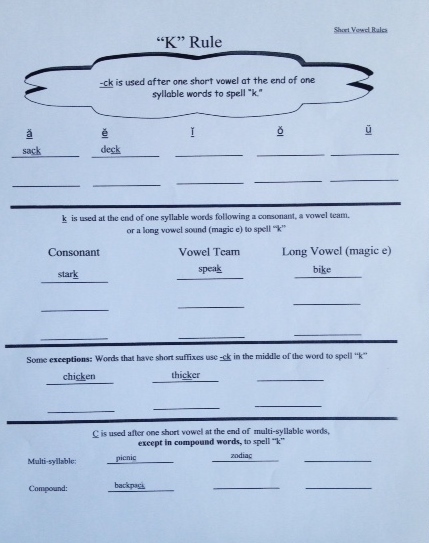 A good way for students to practice hearing the rule is to dictate to them using nonsense words. You will know if they really get the rule or have memorized words. Remember, OG’s method is to see, hear and physically get involved with these terms. So you want to introduce something visually, have them hear it out loud and let you know they understand it in an auditory way, and have them writing what they are learning. For younger kids, I would not call out words that do not belong in the columns. They will still be working on hearing the sounds. I would also begin with real words then move to the nonsense words. This is so nice. I wish all kids had this phonetic approach offered to them. It really helps my kids spell. Thank you! I wish all kids had this approach too.